​​​​ DFW - Just halfway through 2016, researchers at CoreLogic have added up the damage from this year's hailstorms in North Texas. The real estate and finance research firm estimates that the storms that pounded Plano damaged almost 103,000 properties and did almost $36 million in damage. 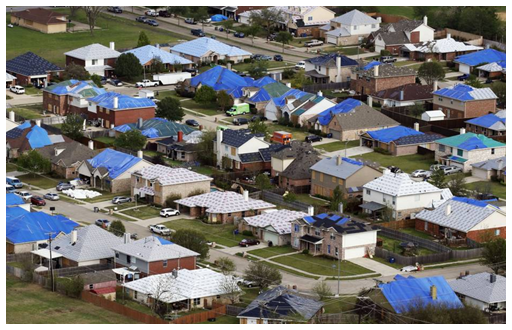 The Wylie storm was worse, involving more than 310,000 properties and an estimated $246.8 million in losses. And in Fort Worth, hailstorms bashed 235,452 homes, adding up to $72.5 million in damage. "Estimated losses from storms in Fort Worth, Plano, Wylie, and San Antonio have already reached almost $700 million, making 2016 one of the worst hail seasons in Texas history," CoreLogic representative Alexandra Hayes said. San Antonio hailstorms did $334.5 million in damage, impacting 263,440 properties, according to CoreLogic. ​See DFW Housing Market Research.